UPDATE: This CAL has ended but you can still find their free pattern here! Are you ready for another CAL? 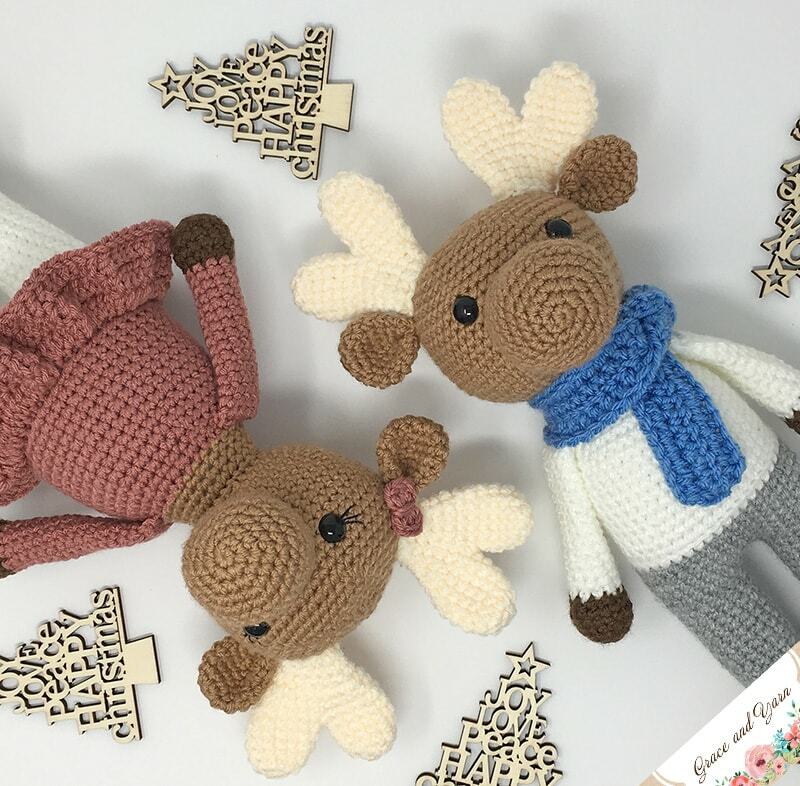 Miles and Millie the Moose are the perfect gift for a little one this Christmas (or even to keep for yourself!). Feel free to make Miles, Millie or both! A moose has been on my (ever-growing) list of animals I'd like to make for quite some time! The nose and antlers gave me a challenge as a moose has such a fun shape and unique details. 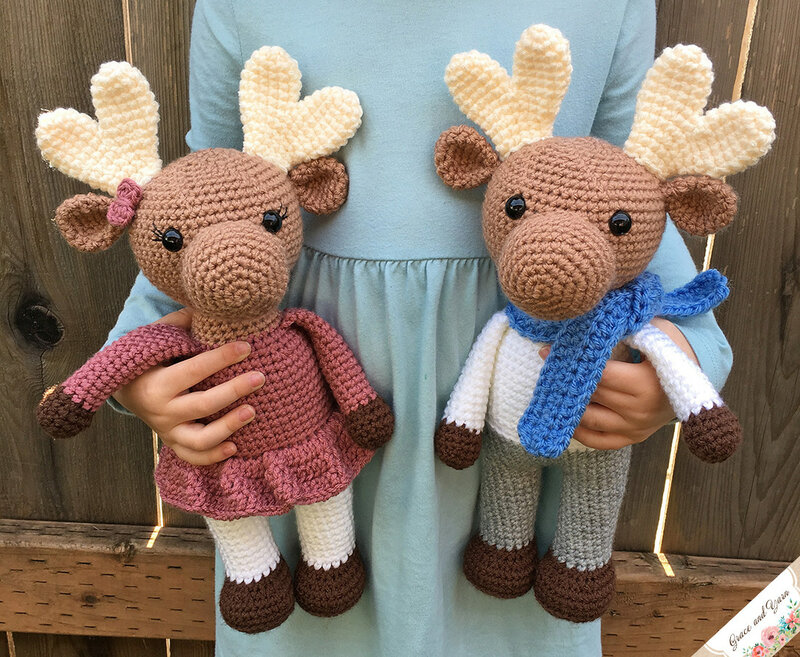 While Miles and Millie may not completely replicate a moose (my husband claims they look like a deer), I had so much fun making them! And I hope you do too! If you have never participated in a CAL (crochet a long) before you're in for a lot of fun! It's a fun event where a group of crocheters come together and work on each part of the pattern together. This CAL will be in 3 parts, each being released a few days apart and is FREE here on the blog. If you prefer to work with an ad-free printable PDF version, one will be available in my Etsy and Ravelry shop starting on Friday! I will also hyperlink each part below in this post, so feel free to PIN it here to save to your crochet board! If you'd like the link sent straight to you inbox, you can sign up for my newsletter here! I'll keep you updated when new patterns are released so you won't miss any! The CAL will start on Friday November 30th and will have 3 parts. If you are new to amigurumi this is a great pattern to work on. I will break down each step and provide helpful photos along the way. Feel free to ask questions at any time! For each moose I used plastic safety eyes which are recommended for children over 3, if you'd prefer you can use crocheted eyes as an alternative. You're finished moose will measure about 14 inches tall, perfect size for cuddling! Now the fun part, picking out your colors! I'll see you back on Friday for Part 1 where we'll make the legs and body! Yea! Can't wait to start. I have all the colours picked out. Can’t wait till Friday!